Phiren Amenca organised a consultation meeting on volunteering for remembrance as part of the network’s annual spring seminar for volunteers, called “Volunteering for Remembrance! – Phiren Amenca seminar on remembrance and human rights education”. 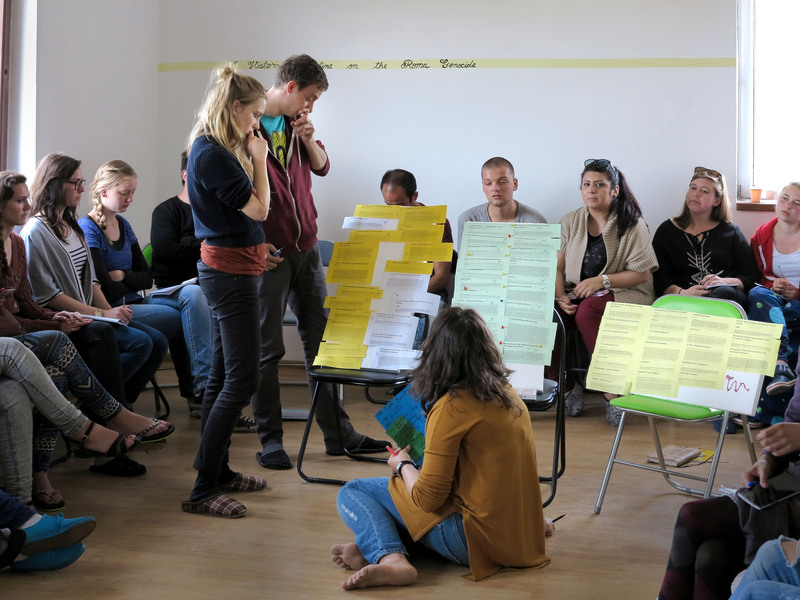 The seminar run from April 26 – May 6, 2015 and bring together 40 volunteers, youth leaders, multipliers, and trainers from over 13 different countries in Oravita, Romania. The project aimed at the capacity-building of Roma and non-Roma youth leaders and multipliers, as well as their youth organizations in their work on remembrance, Holocaust and human rights education in order to challenge stereotypes, antigypsyism and racism. 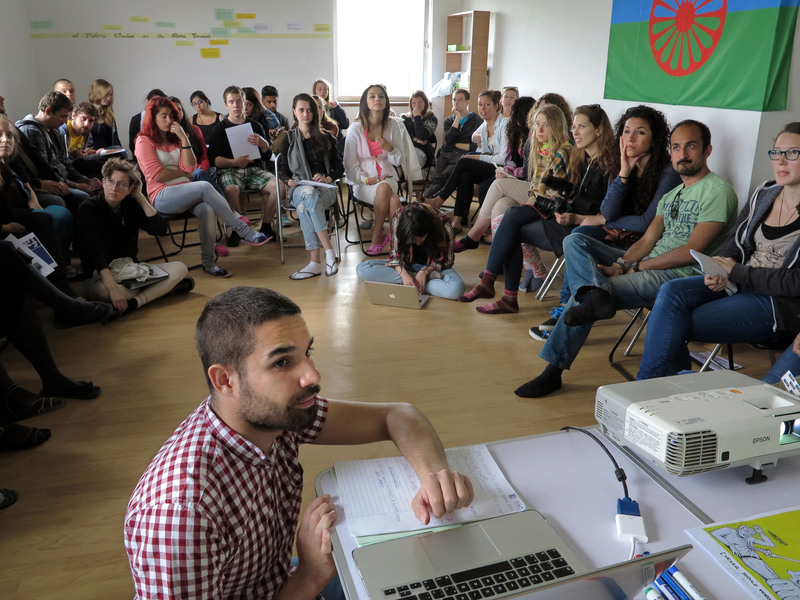 The project raised the awareness of the Roma and non-Roma participants about the remembrance of the Roma genocide, and it developed the skills and tools of youth leaders and volunteers to improve their educational practices on grassroots level around Europe. The fifth day of the seminar was dedicated for the consultation meeting on volunteering for remembrance. Based on the reflection of practices, participants with volunteers from remembrance placements and with the volunteer coordinator of Phiren Amenca had a chance to contribute to develop a strategy plan and recommendations for the Phiren Amenca network regarding volunteering and youth work on remembrance education. We believe it was important to keep the seminar and the consultation meeting together and to organize the consultation as part of the seminar. During the seminar the awareness of participants grew stronger to understand the importance of the past for our lives today, and the relevancy of addressing these issues in the context of human rights education. The seminar allowed the participants to discover and test various educational methods in order to approach the issue, which included the work with oral history and testimonies, methods to strengthen critical thinking and understanding of the societal mechanisms, as well as creative and artistic methods of reflection about remembrance and human rights. For many of the participants it was an important result to learn about the existing educational materials, and how to use them in their local and international youth work. During the consultation meeting some participants presented experiences of voluntary service in Holocaust-related placements in Israel, New York and Paris through the work of the German organization, “Action Reconciliation Service for Peace”. As an outcome, participants developed recommendations for the Phiren Amenca network how to build up a new remembrance and human rights related voluntary service program in the future, which is currently under development. During the consultation participants pointed out the involvement of local volunteers organizing events around May 16 (Romani Resistance Day) and August 2 (Roma Holocaust Remembrance Day) and to organize educational activities around the topics in their local and national level, which can be a first step to become aware and confident about the topic and start a voluntary service in a remembrance placement in an international level. Throughout 2015 we started reached out to new partner organizations in order to set up new voluntary service placements in this context. This process is ongoing and we hope to see the first program in 2016-2017 in realization.